"The wooden Kami(no) bridge connects the Fukagawa districts of Saga and Kiyosumi.The setting in this work is a summer evening. The shadows beneath the bridge at twilight contrast the light of the sunset, creating a fine impression. A sail-boat moves slowly down the river: this scene was one that delighted me. Across the river is Nakazu. No incongruous western-style buildings are visible there, and I could not help but think that this area recalled the period when... Hokusai... designed his Sumidagawa ryōgan ichiran [Glimpse at the two banks of the Sumida river.]" Quoted from: Kawase Hasui: The complete woodblock prints, vol. 1, p. 56. Illustrated in color in volume 2 in a full page image on p. 295. This print is in that special category of Hasui images which were produced prior to the great earthquake and fire when all of his work up to that time was lost forever. 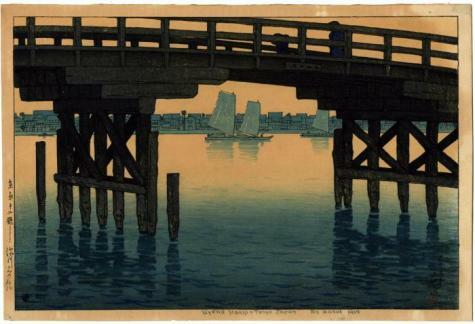 Someone has written somewhat erroneously some information in pencil in the lower margin: "Uyeno Hashi- Tokyo Japan By Hasui 1919". There are also a copies of this print in the Toledo Museum of Art, the Clark Institute and in the Worcester Art Museum. 1) Ukiyoe Museums in Japan (Nihon no ukiyoe bijutsukan - 日本の浮世絵美術館), vol. 3, p. 147. This example is from the collection of the Folk Museum of Ōta Bridge. 2) The Changing City as Depicted in Modern Woodblock Prints: Tokyo in Transition, text mostly in Japanese, Edo-Tokyo Museum, 1996, p. 64.